Magical Wimbledon. Ready for Everything. 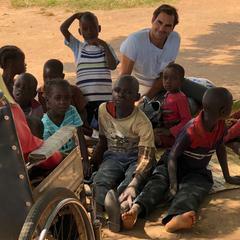 As Wimbledon approaches, Roger Federer reflects on what the tournament means to him and explains how he maintains his passion for tennis 15 years after his first victory there. Wimbledon is coming up quite soon, are you looking forward to it? Of course, I'm incredibly excited that Wimbledon is around the corner. I'm ready to go and I can't wait to walk out on Centre Court on opening Monday. It's always been my favorite tournament, all my heroes won there when I was a teenager – Sampras, Becker, Edberg. I always watched Wimbledon. I guess that's where I started dreaming of maybe one day winning Wimbledon, too. But it was more as a joke than actually being serious. Every tennis fan remembers gripping matches at Wimbledon. Which ones come first to your mind? The first match that comes to mind is the final between Pat Rafter and Goran Ivanišević that went over two days. I thought that was a spectacular game. Obviously I need to mention the epic match of Björn Borg against John McEnroe and Stefan Edberg versus Boris Becker. Not to forget Sampras going on his incredible run. I remember those matches quite vividly. They were very special to me. Did you see the movie "Borg vs McEnroe"? Yes, I saw it, "Borg vs McEnroe" was a good movie, I enjoyed it. The generation of today can see who Borg and McEnroe really were, two legends of our game. They did so much for our sport, bringing an incredible level of popularity to our game. Both of them are amazing people. Borg especially was one of the first to be a global ambassador for many brands around the world, being able to make money as a business, besides the prize money. For me it was very impressive to see how closely Borg stuck to his daily routines. Do you also have such routines? I also have routines, but not as extreme as many other players. I am fairly laid back, but then I like to be on time – typically Swiss. Besides, I just make sure that I have enough shirts in the bag, I have my rackets strung to the right tension, I've warmed up properly, and that I have all the drinks I need in case I play five sets. For me it's just the more obvious things. I usually eat pasta before the game just so I don't get an upset stomach and that has worked very well over all these years. Yet, I don't really have particular things I need to do. You won the first time back in 2003. Do you still remember if there was a certain point where you thought 'yes, I can win'? For me the breakthrough in 2003 was making the semi-finals at Wimbledon as I had never played a semi-final before. I was playing against Andy Roddick. He had won the preparation tournament in Queens, I had won Halle. The two of us were fighting for a place in our first Wimbledon finals. After playing this totally incredible semi-final, I realized that clearly there was a chance I could win Wimbledon. I went from being an underdog in the semis to the favorite in the finals against Mark Philippoussis. But it was only when I was up two sets to love and I was in the tie-breaker of the third set 6-2 and I had four match points that I thought 'I'm going to be Wimbledon champion in the next minute or so'. It was totally crazy. I already had tears in my eyes, I could hardly believe it. And then I hit a serve and volley; a second serve followed, I came to the net, he missed a return and I went to my knees. It was one of those moments, that felt like it was in slow motion. It was a dream come true in that very moment. I wanted to hug whoever was there, my team, my fans. But you are all by yourself and you still have to be respectful towards the game. Yes, I mean it was the childhood dream that became reality. Here I was, on the grass, on my knees. Everybody cheering – that's what you don't have in the backyard or in your dreams. That was incredible for me. The only thing missing maybe in that moment is that you want to be with your family. I wanted to hug whoever was there, my team, my fans. But you are all by yourself and you still have to compose yourself, shake the opponent's hand, shake the umpire's hand and be respectful towards the game and the situation where someone has also just lost when I won. But it was such an amazing moment and one of my most emotional moments ever. Last year you became the record winner of the most Wimbledon Single Men's titles. Another special moment? I don't know how to even tell you! It was so incredibly special last year to win Wimbledon for the eighth time which was a record for any male tennis player at Wimbledon. Nobody ever did that before, actually my hero, Pete Sampras, did seven before and I had tied with him a few years' back. To come back and win Wimbledon after my first victory 2003, 15 years later, not dropping any sets, I was almost in disbelief. I played a great tournament throughout, great finals against Čilić, writing history on your favorite court. There is nothing better than that feeling. If I need motivation to play Wimbledon then I have a problem! Then I know it is probably the end. How do you motivate yourself this year after that record win? I don't need any motivation, I am ready to go, I can't wait to play Wimbledon again. If I need motivation to play Wimbledon then I have a problem! Then I know it is probably the end. But I am very excited, I have been working for three months now to get ready for Wimbledon plus it has been in the back of my head all the way through the off-season as well. It is the big goal of the season wanting to win Wimbledon. So I'd better be ready. It is important that I come in mentally fresh, recovered and feeling good physically. And then of course it would be helpful also to be confident. They say that the replica of the Wimbledon trophy you get home is very small, and you used to make your own larger replica. Do you still do that? Indeed, in the past the replica was very small. Now, the winners get a replica that's only 25% smaller than the original trophy. This change was actually initiated by me. Some years ago the organizers agreed going forward to have that larger size. With one exception, I had to pay myself for the replicas of the previous trophies. But it was worth it. I like to have life-size replicas with the names of the past champions engraved on them. So, although I won Wimbledon eight times, I have more than eight trophies at home because I also keep the smaller ones. It feels like I have 'won' Wimbledon twelve times. And you have them all lined up at home in your living room? The big ones are at the back and the small ones are at the front and the junior ones are flanking them. It's an amazing trophy cabinet, of course. You know, I don't look at them every day but when people come to visit they are like 'oh my God, this is so crazy!'. And that's when it hits you too that it is very, very special. One last question: Obviously you are ready to win the next Wimbledon but are you also looking forward to seeing the new Princess there? Ah ha, yes! I know the Royal Family quite well, and I also watched some of the Royal Wedding this summer. What a spectacle, what a wedding! In a way you want to do it like this, in a way you are also happy that yours is not as big as this one. The marriage was a great start to the summer for London and the country. This will keep going with Wimbledon. I'm very excited. And, yes, it will be very nice to see Harry and Megan. Is active Magical Wimbledon. Ready for Everything.